The Tokyoflash mob have always come up with some fascinating watches – mostly because of their peculiar way of telling you the time. This one however might be the company’s oddest one yet. 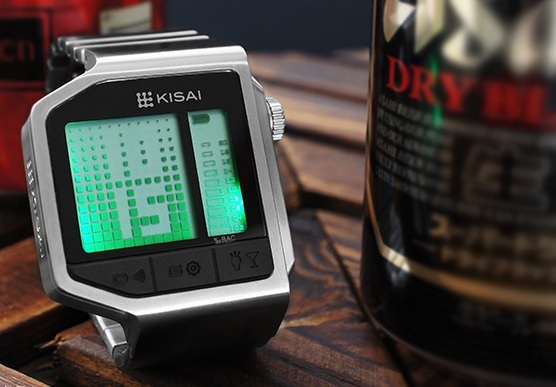 Called the Kisai Intoxicated, it is as it sounds a watch that features a blood alcohol, sensor that will tell you how drunk you are. To make it work you open the sensor cap and press the alcohol button to start the test. Once the sensor has warmed up, you blow for 5 seconds and wait for the watch to give an on screen reading. The display on the right of the screen shows 10 different levels of blood alcohol content. A green display showing 0.00‰ means you’re sober. A yellow display showing between 0.41 and 0.60‰ means you’re buzzing. A red display showing 0.61‰ or above means you’re drunk! I am not entirely sure how useful it might be as evidence should you have a run in with police officer, but it is fun little addition to a very stylish watch which is made of stainless steel, sports an LCD display with colored backlighting and has time, date, alarm and is charged via USB. It is available at the special release price of $99 (€76, £64) until Friday June 21st at 4pm(Japan time).